It was also a great way for me to use up all the left over scraps of material and trims remaining from larger soft goods, such as pillows or upholstered pieces that we sold. ....some vintage bling looks lovely with the softness of the ecru fabric.....vintage swiss dot curtains which I collected in earnest then and now.... love the look for projects. Just like you Nella, to go to the effort to do such a lovely post for all of us when you are not feeling well...I am sending up prayers and all good wishes that you will spring back to better than new so that you can enjoy this joyous season...now about the tuffets such a beautiful idea...and I love the name you gave them, too...and the box for your cousin...truly an amazing gift...fine art straight from the heart. I know she will love and cherish it. Your creations always inspire soul searching, wanting one to reach within oneself to renew our faith. So pleased you are feeling better. Hope to see you soon. We are channeling the same muse! Love your creations! Especially love the box on top! Hope you feel better soon! I hope you're feeling better. Even when you're down your creations are lovely. What a beautiful thoughtful gift. I love your tuffets they are gorgeous!! There is not a thing in your home surroundings that I don't love, I have taken notice of your smallest of details right down to the back drop of the beauty that stages your pieces in beauty and inviting comfort. Your Virgin Mary is ethereally beautiful, as your art is. I am excited to see the results in your spring class with pouring molds and the medium you plan for them. Love that we both have a common interest in Cartapesta paper-mâche. I am going to enjoy get tong to know you so much better here. Dear Nella, hope all is well, do you have another Blog? 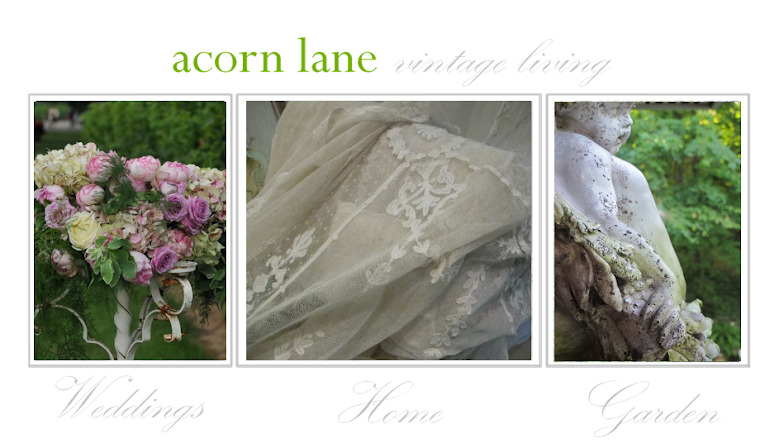 work, as well as other projects associated with Acorn Lane, Vintage Living. I tend to favour a look of casual elegance, with gently worn furnishings accumulated over time, hand tied bouquets just picked from the garden, and always, comfort and attention to detail. More inspiration...full blown garden roses. Collections and obsessions, and a recurring theme..
Acorn Lane Vintage Living and its images are the sole property of Nella Miller.. Powered by Blogger.